How do I know if a digital file/object has been corrupted, changed or altered? Further how can I prove that I know what I have? How can I be confident that the content I am providing is in good condition, complete, or reasonably complete? How do I verify that a file/object has not changed over time or during transfer processes? Please consider reading and commenting on this draft document. In digital preservation, a key part of answering these questions comes through establishing and checking the “fixity” or stability of digital content. At this point, many in the preservation community know they should be checking the fixity of their content, but how, when and how often? A team of individuals from the NDSA Infrastructure & Standards working groups have developed Checking Your Digital Content: How, What and When to Check Fixity? in an effort to help stewards answer these questions in a way that makes sense for their organization based on their needs and resources. We are excited to publicly share this draft document for more broad open discussion and review here on The Signal. We welcome comments and questions, please post them at the bottom of this post for the working group to review. In keeping with work on the NDSA Levels of Digital Preservation, this document is not a benchmark or requirement. It is instead intended as a tool to help organizations develop a plan that fits resource constraints. Different systems and different collections are going to require different fixity checking approaches, and our hope is that this document can help. This guidance was developed in direct response to start to address the need articulated in the infrastructure section of the inaugural National Agenda for Digital Stewardship. I’ll include it below at length for context. Fixity checking is of particular concern in ensuring content integrity. Abstract requirements for fixity checking can be useful as principals, but when applied universally can actually be detrimental to some digital preservation system architectures. The digital preservation community needs to establish best practices for fixity strategies for different system configurations. For example, if an organization were keeping multiple copies of material on magnetic tape and wanted to check fixity of content on a monthly basis, they might end up continuously reading their tape and thereby very rapidly push their tape systems to the limit of reads for the lifetime of the medium. There is a clear need for use ‐ case driven examples of best practices for fixity in particular system designs and configurations established to meet particular preservation requirements. This would likely include description of fixity strategies for all spinning disk systems, largely tape ‐ based systems, as well as hierarchical storage management systems. 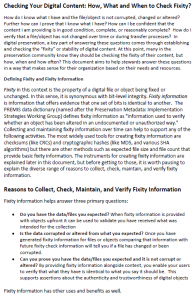 A chart documenting the benefits of fixity checks for certain kinds of digital preservation activities would bring clarity and offer guidance to the entire community. A document modeled after the NDSA Levels of Digital Preservation would be a particularly useful way to provide guidance and information about fixity checks based on storage systems in use, as well as other preservation choices. Again, please share your comments on this here, and consider forwarding this on to others who you think might have comments to share with us. This is a syndicated post. Read the original at The Signal: Digital Preservation 2014-02-07. ← How-to guide for building a university-administered impact management tool for academics.